A PhD is a lonely journey, they say. Working hours and hours on a project nobody else seems to really care about or is as enthusiastic about as you (hopefully) are. It usually involves a lot of self-doubt and stress. Talking to your peers is a great way to deal with these feelings, to realise you are not alone. Another way is to talk with people who share the same passion for certain aspects of your research. They can inspire you, motivate you and help develop your ideas further. Networking, one might call it. I prefer to think about it in terms of what this scary word always involves, in one form or another: travel. That sounds much more pleasant. Travel to Australia for example. With a Masters in Archaeology, I am now based in the Scottish Centre for Crime and Justice Research. This might make more sense when realising my PhD research is part of the Trafficking Culture project, which studies the global traffic in looted cultural objects. My research is socio-legal in name and nature, but I feel more affiliated with fields like indigenous and (critical) heritage studies. 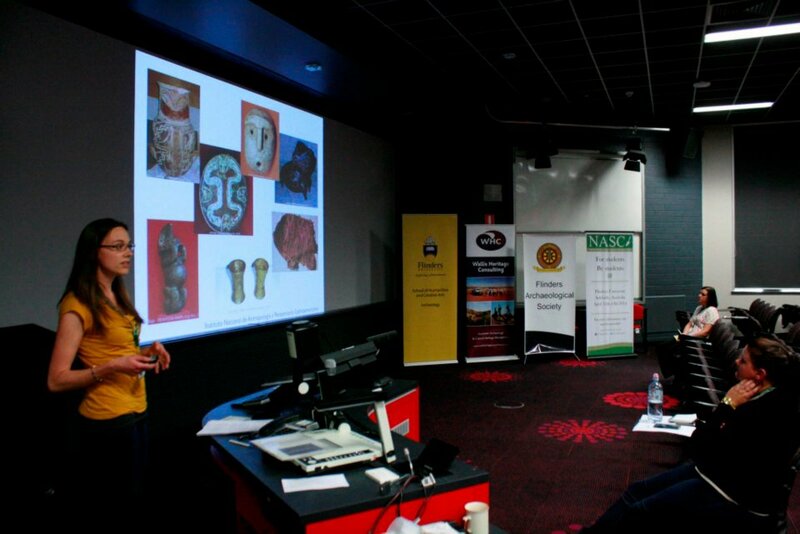 It is therefore not hard to imagine how eager I was when I recently got the opportunity to travel to Australia to present at the National Archaeology Student Conference (11-13 April) and to participate in the Indigenous Archaeology Field School (21-27 April), both organised by Adelaide’s Flinders University. If that was not enough, I was (thanks to a very customer friendly airline) able to add another week to my trip, to first attend a symposium in Sydney. Altogether, it became a trip most worthwhile. 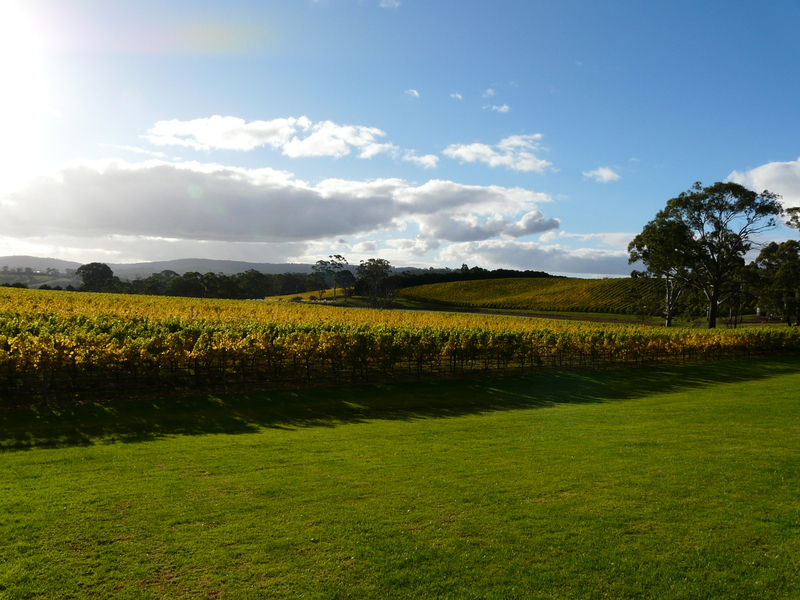 View over the stunning vineyards around Adelaide. In Sydney I attended Museum, Collecting, Agency: a symposium, organised by the Institute of Culture and Society (University of Western Sydney) and hosted by the Australian Museum. Over two days (1-2 April), the concept of (indigenous) agency in relation to collecting and museum practices was discussed by indigenous and non-indigenous scholars and museum professionals, from Australia and New Zealand in particular. It was an inspiring, thought-provoking event and I got to meet some great people. Although this was only the bonus event of my trip, I already felt the countless hours on planes and in airports were well worth it. After a week spent in Sydney, during which I visited some of the city’s famous highlights, of course, as well as spent a few days in the stunning Blue Mountains, I took a flight to Adelaide. Many had warned me the four weeks I planned to stay there would be too long. The so-called City of Churches was one of the most boring cities they knew. Presenting at NASC14, Flinders University, Adelaide. The four weeks started with attending and presenting at the National Archaeology Student Conference hosted by Flinders University. This proved to be a great platform for students, where they could give their first conference presentations, receive excellent feedback by established academics, and, there it is, do some networking. As the name suggests, all presenters were from Australian universities, apart from two Japanese, two Rumanians and me. The papers, presented by students from undergraduate level up to PhD, were of a high standard and many invoked lively discussions. I am sure many learned about for them interesting research being conducted at other archaeology departments in Australia. For me those speakers focusing on indigenous heritage and community engagement were of particular interest. With a couple of them I continue to have contact, asking them for advise and tips in relation to research in these fields which keeps on leading me in new directions. 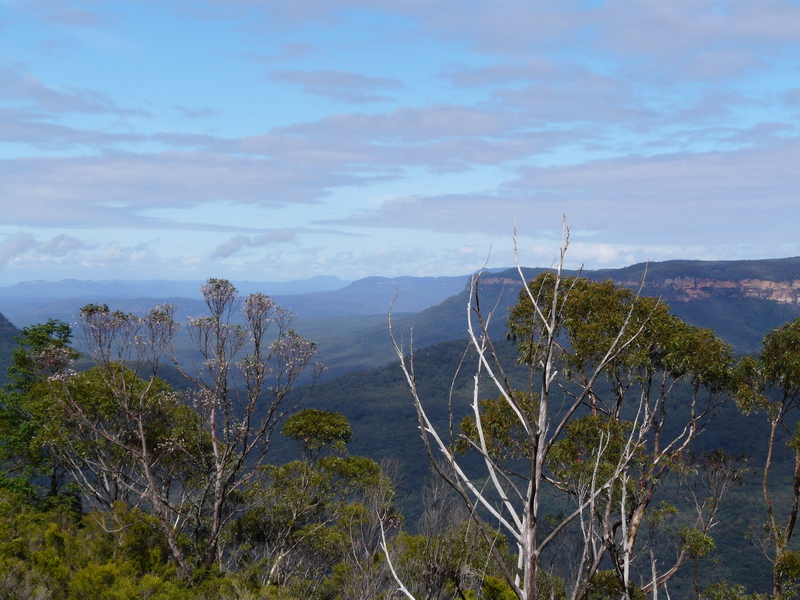 A week later I travelled up north to the traditional lands of the Ngadjuri people. 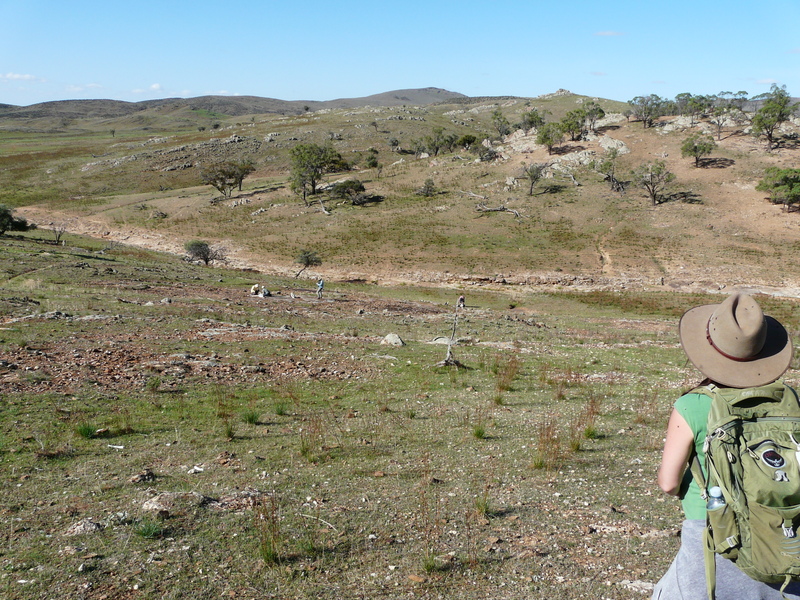 Here I participated in the Indigenous Archaeology Field School, working with Flinders University students and staff and with Ngadjuri Elders. I thought this would be a valuable experience to me because of my interest in collaborative research and community heritage projects. As you can read in the review I wrote for the Journal of Community Archaeology and Heritage, it certainly was. I learned a lot about collaborative research, and about Aboriginal culture, history and current struggles. I also greatly enjoyed being able to make use of my previous experience in oral history projects to guide students conducting theirs. Overall, Adelaide brought me the inspiration, motivation and contacts I was looking for, along with a lot of fun, amazing road trips, and some good friends. A boring place you said? Rock art being recorded by students of the field school, Mid-North South Australia. The six week trip was much more to me than a visit to a new country, a new continent, gaining relevant experience and meeting some people. It increased my confidence in the journey I am undertaking. I have asked myself the following questions many times since I started this PhD: what was my main motivation to start this particular project, what interests me most in this research, and where do I want to go? Australia did not make me drastically change any of the answers I previously had given. However, it helped me formulating them more clearly and, maybe due to being in an environment with more like-minded people, I somehow dared to plant these answers firmly in my mind. 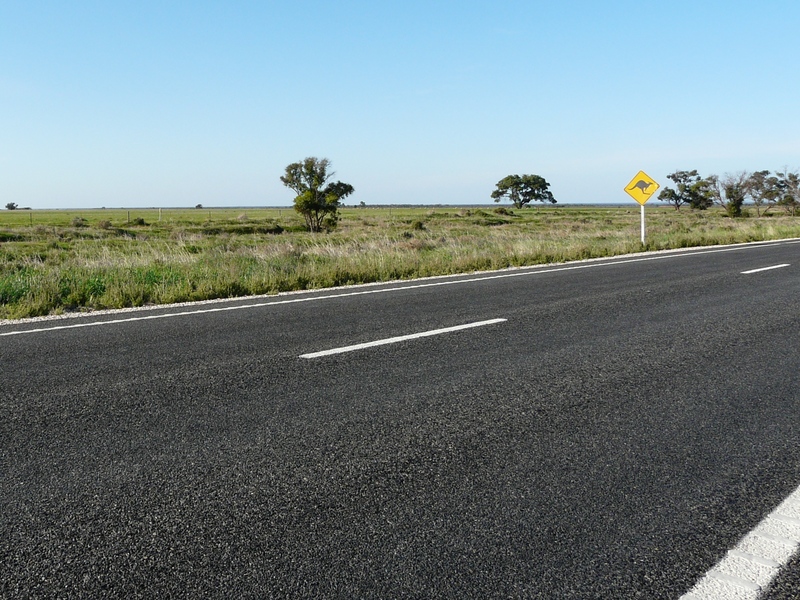 On the road through South Australia. Many important decisions have to be made along the journey that is called PhD. Since Australia I got these firmly planted ideas about where I come from, what I want to do, and where I want to go, to go back to. Doing that has helped me each and every time I had to choose my next steps. I have left my office for some additional trips, albeit only to other university buildings. Nonetheless, the people I met there have in a similar way assisted me with developing my ideas further and finding new routes. More (international) visits are planned; others can hopefully be added to my diary soon. Call them networking, I keep on travelling. Annemiek Rhebergen is a (soon to be ESRC funded) PhD student with the Trafficking Culture project. Her research focuses on the looting of archaeological sites in Northwest Argentina, with a particular interest in how the state’s approach towards this issue is perceived by and affecting local indigenous communities. She holds an MA in Archaeology, with a focus on Heritage Management, from Leiden University (the Netherlands) and has done archaeological and ethnographic fieldwork and worked on community heritage projects in the Netherlands, Italy, Ecuador, Palestine and Australia. You can reach Annemiek via email at a.rhebergen.1@research.gla.ac.uk or on Twitter @AnnRhebergen. I am grateful to the Archaeology Department of Flinders University, and especially Professor Claire Smith, for inviting me and making this trip possible, as well as to the School of Social and Political Sciences of the University of Glasgow for providing additional support.